Tammie King here to introduce you to an awesome debut author. 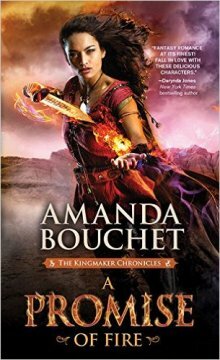 Months ago I got in an advanced copy of Amanda Bouchet's "A Promise of Fire". I love fantasy romance, so I sat down and got started on this book because the publicist was raving about it. Sourcebooks doesn't send out many print ARC's, so when they do I take notice. I've not read a GREAT fantasy romance like this in years...like since C.L. Wilson started to publish with Dorchester and then Avon. I was swept away by this book. You can read my review here. Today I have the pleasure to introduce you to Amanda as she answers a couple of questions for us. What kind of research did you do for A Promise of Fire? What was the most interesting thing you uncovered? This is such a great question! I ended up doing more research than I expected while writing, although not all of it ended up in the book. A Promise of Fire is set in a world based on Greek mythology. In Thalyria, the world of The Kingmaker Chronicles, we have the same Gods and creatures as the ancient Greeks in their myths and can find danger and adventure reminiscent of Homeric tales—epic exploits, heroic figures, monsters, magic, mayhem, and more. Grounding the world in something familiar to many readers was a fun way to get the story rolling quickly, keep it character-driven, and leave more time for romance and adventure! "Cat" Catalia Fisa lives disguised as a soothsayer in a traveling circus. She is perfectly content avoiding the danger and destiny the Gods-and her homicidal mother-have saddled her with. That is, until Griffin, an ambitious warlord from the magic-deprived south, fixes her with his steely gaze and upsets her illusion of safety forever. The research I found the most interesting involved the Underworld, the realm ruled over by the God Hades where ancient Greeks believed all people went for their afterlife. Vague memories from childhood (or maybe my family was trying not to scare me) had me thinking this was a pretty good place for everyone, although some had it even better in the Elysian Fields. The truth of the myth, it turns out, is that a few people had it very good and most…didn’t. If a person was buried with an obol, a small coin to pay the ferryman Charon for passage across the River Styx and into the land of the dead, the deceased then awaited judgment on the other side of the river. Already, if they lost their coin or were too poor to pay, they were left to wait, forever, without hope, on the bank. Yikes! If they crossed the Styx, the dead were then met by Cerberus, the petrifying three-headed hound whose job was to bar anyone from escaping back to the world above. Next came the dismal trudge across the Plain of Asphodel, the flat, gray, gloomy land of mist and shadow where nearly everyone ended up, not condemned to any special torment, but drifting aimlessly and miserably bored—forever. Double yikes! After a little more wandering and hopefully avoiding a pool you would not want to drink from, for the recently deceased next came judgment and one of three paths. Most went back to Asphodel, and if they happened to drink from the Pool of Lethe before that, they had to roam the dreary plain forever without even their past memories to sustain them. Ugh. The lucky few with a special claim—those great heroes who had pleased the Gods—went down the path to Elysium. Here, everything was bountiful, beautiful, and filled with music, banquets and light. Good times! Then there was the third path, to Tartarus and eternal punishment. Anyone truly wicked or who had angered or defied the Gods ended up in endless anguish with no escape. Most of the Titans went here after the Olympians won the War of Gods, along with others, like Sisyphus, who was condemned to push a giant boulder up a hill only to have it roll back down again the moment he succeeded and have to start all over again—forever. At this point in my research, all I could think was that at least Sisyphus was doing something and not wandering in endless, aimless boredom on Asphodel. That said, unless you’re an epic hero, it all kind of stinks. I’d like to pass some of my Greek heritage on to my own kids, but they’re still pretty young. I might stick to the less nightmarish stuff for now. Actually… Medusa, the Hydra, Pandora, Oedipus, Midas, Prometheus getting his liver pecked out by a giant eagle every day… Maybe I’ll wait!